Olive Oil has long been seducing our taste buds. This oil in all its unctuous glory has annointed the food of princes, potentates and people of every walk of life. Let Back Chat take you on the fascinating Journey of Olive to Oil. Enjoy the ride and if you find that you have a problem or would like to know more, please post a comment on Back Chat or email me at les@leslieback.co.za . I would be delighted to hear from you. This wonderfully aromatic ingredient has long transformed and enhanced the simple dishes of the Mediterranean. Today cooks worldwide are enjoying the rich smooth fruitiness of this unique oil. The olive oil trade is booming and exploding all over the world In an industry that can hardly keep up with demand and in spite of legislation, there are unscrupulous traders taking advantage of the situation. When choosing olive oil buy from reputable producers, especially private estates and at stores where there is a well developed sense of consumer protection. Develop your taste and the ability to choose and buy an olive oil with confidence. Become an enthusiastic member of the ‘cult of the olive’. Do we understand ‘Olive Oil Speak’? Do we know the difference between good and bad oils? And vitally, are we sure that the contents of the container agree with the labelled description? There are countless imported and local brands to choose from, so many that we seem to negotiate an obstacle course selecting an oil that is ‘just right’; an oil that will produce the sublime taste that we know and love. To resolve these questions, it is necessary to understand the fascination and complicated journey from olive to oil. The olive is a fruit similar to the peach or plum with a central stone containing the seed, fleshy covering and skin. The olive tree OLEA EUROPEA, is an evergreen tree and flourishes in a Mediterranean climate. Long sunny summers, light spring and winter rains and rarely any frost produce ideal conditions. It is no coincidence that the olive grows where the vine flourishes. Spain, Portugal, Tuscany, Greece and France are also ideal for growing and producing. Spain is currently the main olive oil producing and exporting country in the world. The Western Cape of South Africa, one of the areas that present ideal conditions for olive growers, produces 30% of the 700 tons of oil consumed annually in South Africa.. Local producers are now winning kudos and prizes in international competitions. Olive trees flower in spring, and the fruit starts to form and ripen. It changes from green to black between the summer and the end of autumn and the beginning of winter when harvesting takes place. To make a quality olive oil, hand picking although expensive, is the best method as the fruit will not be bruised or the tree damaged. About 20% of Italian oil is derived from handpicked olives. Handpicking is used for the highest quality oils and although laborious is eminently worthwhile. ‘Harvesting by natural fall’ is another method. This involves shaking or beating the tree with sticks or poles. The ripe olives fall onto nets or cloths spread underneath the trees. The problem is that this can damage the branches of a tough and resilient tree., but does produce 20-30% extra oil with certain olives. Half-ripe olives produce fruitier, more robust oils, whilst fully ripe olives produce more delicately flavoured oils. After harvesting, the extraction of the oil must follow as soon as possible. The olives must be processed within 24 hours after picking for quality olive oil and to prevent any chemical changes from taking place. First the olives are washed (up to 4 times). Earth, leaves, twigs and any foreign bodies are removed. This prevents oil from becoming bitter. Next the olives are crushed using a series of stainless steel blades. The result is a mixture of oil, water, solid pulp and pips. This is moved to a stainless steel chamber. If, during the milling process where the oil is extracted for the first time from fresh olives, the temperature does not exceed 30 degrees, the oil can be said to be cold pressed. Low temperatures preserve temperature-sensitive vitamins and anti-oxidants. For the cook it protects valuable flavour and aroma. There is a cachet in using traditional methods of crushing the olives with stone mills and extracting the oil by pressure. For traditionalists this is the best way. Although slower than modern methods and requiring more manpower, the fresh delicate flavours of this cold pressed oil are preserved. Today the crushing is done aided by electricity. The olives are sorted and washed only once. The grinding wheels are usually granite and it takes about an hour to crush the fruit including the stones. The resulting paste is placed on esparto grass or synthetic mats, one on top of the other on a vertical pole, under a hydraulic press. Slowly the pressure is increased and the precious oil is squeezed out. A centrifuge filters the oil. The old methods are slow and expensive; the newer methods are faster and more hygienic. Coincidentally they both produce good and not so good oils. The oil obtained is stored in big terracotta jars or stainless steel containers in cool dark cellars or warehouses until ready for bottling. The ideal temperature is between 15 and 18 degrees centigrade. It is the sediment which makes unfiltered oil look murky. This can be removed in the settling or filtering process. Some producers use natural settling when the oil comes to the top and the water goes to the bottom. Others prefer filtering through cotton or synthetic cloths. The third type of pressing requires heat and chemical treatment as any oil left in the POMACE [residue] is by now difficult to extract. All kinds of processing can take place to extract olive oil by-products from the pomace. These are used in the manufacture of soaps, shampoos, conditioners, cosmetics and toiletries and are usually made from the lower grade refined oils. Some unscrupulous operators mix low-grade olive oil with pomace and call it pomace olive oil. Decoding or deciphering a label, learning and understanding the ‘olive oil speak’ helps to select the right olive oil for your table and budget. This gives information on flavour, grade and use. Chemical factors determine the description of olive oils. The International Olive Oil Council classifies olive oils. EXTRA VIRGIN OLIVE OIL AND VIRGIN OLIVE OIL. The difference between these oils is in their acidity and the order of pressing. Both are natural and unrefined. Cold pressed extra virgin olive oil is best as it benefits from the full preservation of flavours, vitamins and anti-oxidants that are so vital for good health. This is a Virgin olive oil whose free acidity or oleic acid is not more than 3.3% or 3 grams per 100 grams. It is also produced by the second pressing and is still natural and unrefined. This label is applied when the acidity exceeds 3.3%. 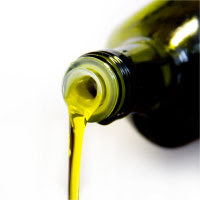 It is usually a blend of extra virgin olive oil [or virgin olive oil] with refined oil. This is olive oil that has been treated chemically to lower its acidity. Its free acidity or oleic acid cannot be more than 0.5% or 0.5 grams per 100 grams. This is blended with extra virgin olive oil in differing degrees to obtain differing aromas and tastes. Virgin oil not fit for consumption as it is, is designated Lampante virgin olive oil. It is virgin oil with a free acidity, expressed as oleic acid of more than 3.3 grams per 100 grams. It also can have other chemical characteristics. Such olive oil is intended for refining or for technical purposes. These are usually sold under the labels of PURE OLIVE OIL, OLIVE OIL or LIGHT OLIVE OIL. This is a taste description and not a kilojoules measurement. Steeping fresh herbs in the oil makes flavoured oils. Herb flavours such as tarragon, basil, garlic, mint, fennel, marjoram, thyme, rosemary and savoury can be imparted to the oil quite easily. POMACE, WHICH HAS BEEN CHEMICALLY EXTRACTED TO DISSOLVE THE OIL RESIDUE, CANNOT BE CLASSIFIED AS OLIVE OIL. This is a blend of refined olive pomace oil and edible virgin oil, not including Lampante. This cannot be classified as olive oil. The flavour and nutrient value is very reduced and is really best for cooking, such as deep-frying. In the United States different names apply to grades One might also be unfamiliar with the names applied to grades in the E.U. countries. Olive oil is 100% fat, has no protein, no carbohydrate, no sodium, no cholesterol, no minerals but a trace of vitamin E which is fat-soluble. There are also vitamins A, D and K. One hundred grams of olive oil has a calorific value of 884. It is suitable for vegetarians and vegans. It is invaluable for cardiovascular health and prevention of other diseases, primarily various forms of cancer. The oil is packed and sold in tins; glass bottles or special plastic bottles and must be stored out of the light to prevent oxidisation. If the colour is a good luminous gold or green the bottle will be clear to show it off. Otherwise it is often packed in green glass bottles, disguising the colour of the oil. However, coloured glass also protects the oil it from the light. There are many elaborately packaged oils, whether they are any better than plainly packaged oils off the supermarket shelf, is debatable. One is also at the mercy of ‘price irrationality’. Price is not usually a good indicator of the quality of the oil, as many factors come into play affecting the retail price. Outright profiteering, exchange rates and importers wanting to rid themselves of quantities of stock are some of these factors. In reading a label is to ascertain whether imported oil is bottled in the country of origin. This helps to avoid situations where the oil has been adversely affected by bulk importation and then bottled in South Africa. There is a constant debate as to whether deterioration is associated with the overseas producer or the local importers. There is also the matter of DECEPTIVE OR FALSE LABELING. A label proudly bearing the qualification of extra virgin oil may not be that at all. It may be a combination of many things; for instance some diluted extra virgin oil may be blended with sunflower oil to add volume. This destroys its flavour and all the healthy components. There are other dubious combinations. Some low-grade oils, such as an ordinary olive oil, are chemically treated to reduce their acidity and sold as virgin or extra virgin oils. Here again the effect of the oil is falsified. Cheap oil is never a bargain and ruins everything with which it is combined. Bad conditions of the fruit, in other words not good olives, bad handling and bad storage affect the flavour. Cleanliness is paramount as olive oil can be contaminated. Odours from fermentation of waste can get into oils in the processing plant. Clean machinery, floors and walls prevents rancid odours. Cleanliness is especially important in the olive washing machines where the washing water needs to be kept clean at all times. Tasting is necessary to appreciate the character and personality of an olive oil. Certain precautions need to be taken before tasting the oils. Screen the oils by their aroma so the milder oils are tasted first and the more intense oils last. Avoid use of perfumes, deodorants, and perfumed soaps and do not smoke, eat sweets or drink coffee within 30 minutes before and during tasting. Health and cleanliness of hands and mouth are obviously essential. The oils should be tasted in a clean light and airy locality, using glasses for every sample. The actual tasting can be done in one of two ways with the oil spread on unsalted white bread or directly from tasting glasses. When using glasses, professional tasters use a dark blue glass so they are not influenced by the colour of the oil. The colour does not reflect quality. They begin with a few noisy ‘slurps’, an action that aerates the oil, while coating the taste buds on the back of tongue and palate. A good olive oil should smell fresh and fruity and be reminiscent of newly cut grass, free of any traces of rancidity. It should not be bitter, but leave a peppery aftertaste. THERE IS A GOOD DEAL OF DESCRIPTION AND ‘OLIVE OIL SPEAK’ SURROUNDING THE TASTING AND DESCRIPTION OF OLIVE OIL. STYLE When tasting, the style of an oil must be considered. This is the first impression and unlike wine, nothing to do with colour. Green or bitter describes the taste of oil from green olives and those just turning colour. If it is an intense taste it will probably be unpleasant, otherwise it is typical of olive oil. BITE This refers to the instant impact from oil when it is tasted. Not all olive oils have this characteristic. Others with a strong aroma or flavour are said to have DEPTH or to be STRONG. Those with a weaker aroma and flavour come into the light or mild category. SWEET OR SOMETIMES RIPELY FRUITY. A slightly sweet taste is present in some olive oils. These are called sweet or ripely fruity. Ripe fruit will sometimes produce this type of oil, which has a somewhat weak aroma. SMOOTH This is a derogatory term and describes oils without a great deal of character regarding aroma and taste. PUNGENT, PIQUANT, FRUITY, ASTRINGENT AND AROMATIC. These are all forceful adjectives and apply to the more robust kinds of olive oil. PUNGENT This describes a strong-flavoured oil with a touch of bitterness, enough to make it interesting rather than unpleasant. PIQUANT This word describes oil that gives the taster a hot, spicy, peppery sensation at the back of the throat. ASTRINGENT This is used to describe a sensation of many flavours at once, such as when tannins are present in the mouth. There are nine of these: apple, banana, lemon peel, ripe melon, orange peel, passion fruit, cooked fresh pears, tomato skins or fresh tomato juice. Against these are only four [seemingly] vegetable flavours. They are avocado, artichokes asparagus and mushrooms. This describes a peasant/rustic flavour, which is not entirely complimentary. This describes oil that is reminiscent of a bouquet of flowers. This sounds rather Chinese in concept, and applies to oils, which have good rations of aroma and taste factors. No one feature should dominate another and the whole should produce a sense of harmony and balance on the palate. There are oils for salads, frying, marinades, baking and cosmetics. In the kitchen, olive oil reigns as queen in spite of fierce competition from a cheaper, wider range of oils. Olive oil triumphs because it offers variety in taste, aroma and colour. Extra virgin or virgin olive oils are the best choice as an ingredient for flavour. Because olive oil is high in mono-unsaturated fat, it can safely be heated 5-6 times for frying. Lesser quality olive oils with a relative lack of flavour compared to their virgin counterparts where flavour is not critical, are suitable for this. Olive oil, this centuries old unrivalled ingredient, plays a vital part on our contemporary table, adding unique flavour, goodness and lustre to our dishes, deserving the greatest care and understanding.